Though you may remember science class as dull, much has changed. The Internet has done the impossible and made science a lot more accessible, bringing scientists and science enthusiasts together to share and discuss the most interesting discoveries of the day. Online, you can find fascinating science news and explanations on YouTube, Facebook, Twitter and more if you know where to look—and it's all a lot more interesting than any high school science textbook. Here's the best of what's out there. 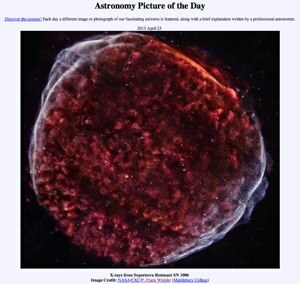 Just like the title says, this NASA site provides a high-resolution space photo every day with a description written by a professional astronomer. And while the quality varies, there are really no photos here that we'd rate anything less than astounding. If you like what you see, there's an archive going back to 1995 full of wondrous images. There's also a list of sites that translate APoD into different languages and a list of resources on that same page to access APoD by email, Facebook, mobile phone and more. This online radio program features astrophysicist Neil DeGrasse Tyson talking science and space—often with celebrity guests! The website offers their latest episode as well as an extensive back catalog to browse. You can listen to Chef Anthony Bourdain explain molecular cooking or actor Alan Rickman discussing science and science fiction. With or without guests, Neil always finds a way to make the world of science more entertaining. Interested in doing a bit of stargazing with man-made stars on display? Spot the Station lets you sign up for notifications of when the International Space Station will pass overhead at your current location, so you can see it for yourself. The Space Station appears brighter than any planet or star (except the sun) so no telescope needed! 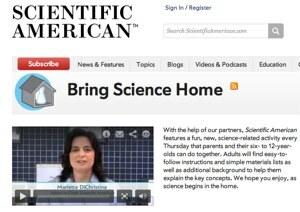 This weekly video program from the website of the famous magazine Scientific American walks you through great science activities to do with the kids—or just for fun. You can learn how to make craters with mini-meteors or your very own carbonic colors. And for days when there aren't new videos, there are lots of activity walk-throughs to browse. These clever YouTube videos explain scientific concepts with a clear voiceover and simple drawings, offering both entertainment and education all in one place. Unlike the name suggests, most videos are several minutes long, so be prepared to spend well more than a minute browsing MinutePhysics. Great videos to start with include The Theory of Everything and There is No Pink Light, as well as a primer on the famous theory of Shrödinger's Cat. ASAP Science is another great YouTube channel that uses drawings and great writing to explain complex scientific ideas in a simple and engaging way. If math was your least favorite subject, Vi Hart may well make it your favorite or at least bend your mind by introducing it to crazy new concepts. Like MinutePhysics, prepare to spend well more than a minute (or even several) browsing these videos. Be sure to check out Folding Space Time and Hexaflexagons which shows her true charm and love of science. 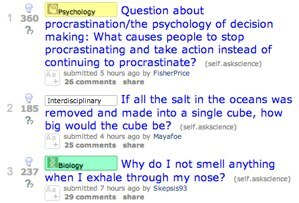 The AskScience community on Reddit.com allows you to ask any question you like, and the community—filled with both scientists and science enthusiast—will provide answers. This is great for both reading and satisfying your scientific curiosity. I F***ing Love Science (and it's pared-down kid-friendly cousin Science is Seriously Awesome) deliver amazing science pictures and facts directly to your Facebook feed. With fascinating updates multiple times a day, these two Facebook siblings can be a welcome relief among the more annoying posts in your news feed from friends and relatives. And, if you haven't seen this feed already, the title is the only thing that's not safe for work. This blog by astronomer Phil Plait talks a lot about science in politics, but also covers plenty of cool science news, presented with a heavy dose of pop culture. This National Geographic blog covers hard scientific research, but without any confusing science jargon. With posts like Will we ever communicate telepathically? and The Invisible Hand Illusion, science is downright engaging. 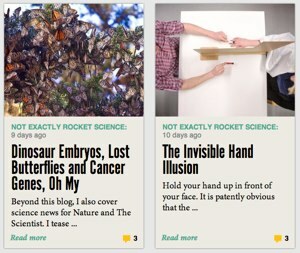 For those who prefer their science to be Tumblr-sized, It's Okay to Be Smart offers an eclectic mix of science articles, videos, and photos on your Tumblr dashboard. If you don't read the science-friendly webcomic XKCD (and, really, you should), you might have missed the author's entertaining What if? section. Here, you'll find strange hypothetical questions (such as "How much would the sea level fall if every ship were removed all at once from the Earth's waters?") answered in great—and often entertainingly exaggerated—depth, complete with the stick figure illustrations for which XKCD is known. This site collects collects odd science news and also rewards the Ig Nobel Prize, which, in their words, is to "honor achievements that first make people laugh, and then make them think." Their blog definitely does that for us. Not enough science? Here are some great science personalities you can follow on Twitter to get science news and conversation right in your Twitter stream. NASA @NASA: If you're following just one science-related Twitter account, it should be NASA, which keeps followers up to date on the latest space news. Curiosity Rover @MarsCuriosity: And if you're following two science-related Twitter accounts, the second should be Curiosity, which tweets photos and selfies all the way from Mars. Bill Nye @TheScienceGuy: Yes, the actual "Bill Nye the Science Guy" is on Twitter, though it doesn't do his traditional bow tie justice. Neil DeGrasse Tyson @neiltyson: We mentioned Tyson's StarTalk radio program, earlier, but he's also quite the personality on Twitter. Phil Plait @BadAstronomer: Plait, of Salon's Bad Astronomy blog, also keeps up science conversations on Twitter. Chris Hadfield @Cmdr_Hadfield: Chris Hadfield is the current commander of the International Space Station and regularly posts fantastic space photos. Hopefully we've opened your eyes to just how amazing science can be. If we missed any great online resources, let us know in the comments below.